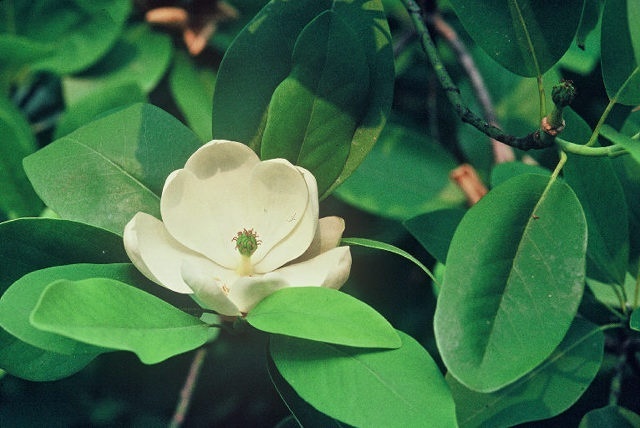 The sweetbay magnolia is a graceful, southern evergreen to semi-evergreen tree. It will tend to be more evergreen the farther south it is planted. In nature, it is found most often in moist, acid soils near swamps or stream banks in the eastern United States. It is a small, typically multi-stemmed tree, columnar in shape with a mature height of 20 to 30 feet in the northern and 60 feet in the southern ends of its range. Its small size makes it an excellent tree for planting next to buildings or in urban areas with little space. It is prized for its creamy-white, lemon-scented flowers that appear from June through September and are followed by small red seeds which are enjoyed by a variety of wildlife. Sweetbay magnolia roots easily, is tolerant of droughts and floods, and will grow in part to full sun.